Jessica's Fall 2012 Collection Spicy Dream just arrived, and although I haven't had time to swatch them yet, I was struck by how much prettier they are in real life. I saw the print ad last week, and while I love Jessica's formula, I wasn't impressed with the color selection I saw in the ad. We all know promo pictures can be misleading...remember Vogue Magazine's photo of Chanel Black Pearl? Some polishes look unbelievably stunning in promo shots, but they certainly don't live up to the hype once that bottle's in your hand. Then there are some promo and ad photos that simply don't do justice to the actual product, which is the case with this collection. Check it out. Here are some scans of the ad for Jessica's Spicy Dream Collection. I love the simplistic classic artwork drawing, the falling leaves with just a hint of color, the name of the collection. All very Fall-like and appealing to my artistic side. I shouldn't like the concept and the theme of the ad more than I like the product it's selling though. My first problem lies with the depiction of the swatches. Print swatches seldom tell the whole story, but they should show a little something that might entice me. These look like straight creme shades in colors that don't appeal to me one way or the other...with cute names though! My second problem is regarding the bottle shot in the ad. The large bottle shot shown in the ad is Pumpkin Delight. Alright, I love the name Pumpkin anything, particularly when it has to do with food or cosmetics, and especially this time of the year when we're all looking forward to Fall. The shade is pretty, but I'm not really feeling it, you know? Stay with me here, I do have a point! Well helloooooooo pretty colors! Your personality needs to quit hiding behind print ads! Once you're out of the box, you have some stunning qualities, don't you? Pumpkin Delight, you needn't be so shy during your next photo shoot, you're a natural beauty with hidden facets of intrigue. Not to mention sparkles and colors aplenty. Well who do we have here? The label on the bottle says your name is Gingersnap, but you look so much better than your muddy beige magazine swatch. My point is two-fold. To the consumers, don't buy into the hype of ads. You may be disappointed in the actual product. Likewise, don't overlook products in an ad based on their appearance. You might be disappointed that you passed over a product because the ad didn't represent something accurately. Ads do draw attention to a collection and inform consumers that they're out there. However, they can sometimes be very limited in their ability to sell a product, or misrepresent a product entirely by either under or over enhancing it. To the manufacturers and brands, you make some beautiful polishes and cosmetics. You pay big money for marketing and advertising. Make sure that ad works in such a way that the product is showcased to its full potential. I'm not insulting Jessica in any way, but they are a handful of brands that I think make a top quality product, and for some reason these brands seem to go under the radar of many consumers. 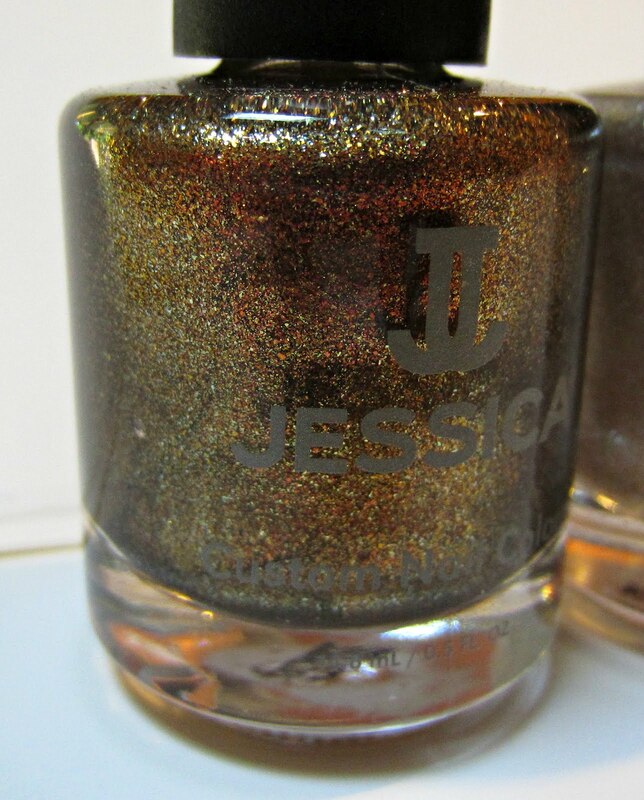 Jessica is one of my favorite brands, and I think their polishes should be recognized more. Print ads aren't cheap, so don't allow them to diminish the beauty of a product. Make the ad sell the polish. I am reminded myself to always try to remember to look at swatches and reviews before buying or not buying a product. I have fallen victim to impulse buying based on a print ad, just as I've passed up a product based on a print ad, particularly when I can't find swatches available. And I've been disappointed not only in myself for not researching further, but also in the advertising business for not publishing a more accurate product depiction. Swatches will be forthcoming, but in the meantime, here is a brief description of the shades. Even though they all appeared to be cremes in the print ad, there's only one true creme in this collection. Crimson Tattoo is a deep vampy blood red/burgundy shade with a jelly finish. Cinnamon Kiss is a charcoal based deep crimson shimmer, Champagne Bubbles is a metallic silver with tiny multi colored glitter, Brown Sugar is a medium cocoa shade with extremely small hidden golden shimmer, and the photos of Pumpkin Delight and Gingersnap above describe those shades much better than my words could. Gorgeous collection, Jessica. 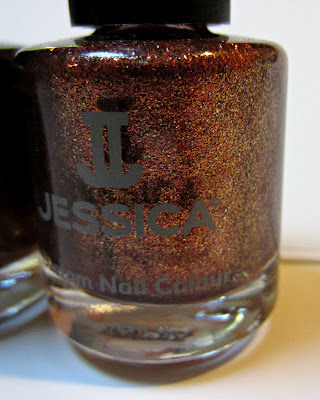 This is a nice range of colors and finishes, and the collection name and shade names are perfect for the season. Your print ad doesn't tell the whole story. At all. Oh I agree... that print ad really does nothing for this collection. Your bottle shots sold me though! Print ads seem to be more and more misleading. Usually I am more impressed with the ad than the polish, but in this case the opposite is true, those are gorgeous!! Want! When do these come out? The bottle shot of the 6 together sold me! Anonymous~sorry, I was so flustered from their prettiness I forgot to mention a release date! The will be available on Jessicacosmetics.com this month, but I don't have an exact date. Hot damn! I'm going to need this whole collection! I'm a huge fan of Jessica. They could do so much better with their marketing. Maybe you should suggest a tie-in to them. I never buy on ads. I buy through blog posts! Wow! bottles a zillion times better! I love browns and will want all of these!